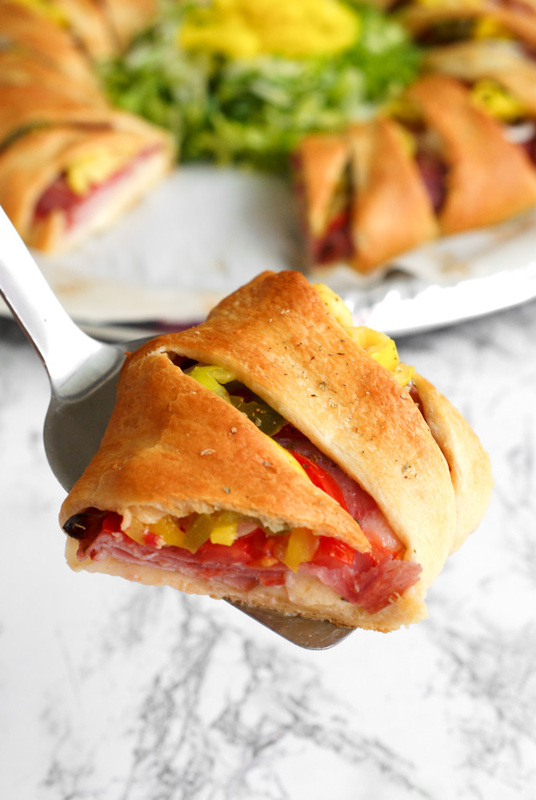 An Italian Sub Crescent Roll Ring is packed full of ham, salami, capicola, and provolone cheese all tucked inside a ring of golden crescent rolls. I am so very in love with subs. Not just any old sub, but Italian subs. 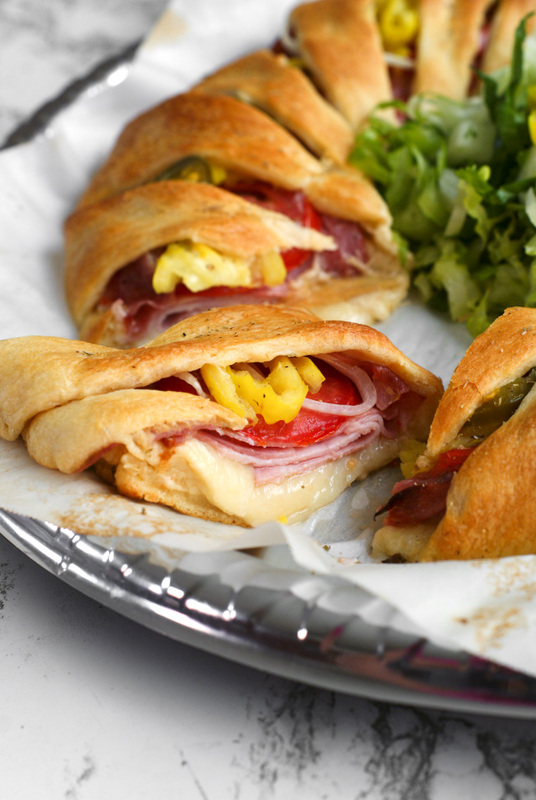 Mmmmm....there's something so completely scrumptious and irresistible about all of those Italian meats and provolone cheese piled high on a chewy roll, topped with vinegary banana peppers, juicy tomatoes and crisp lettuce. Yuuuuummmm. My mouth is watering just thinking about it. Subs are spectacular party food, great for game day or birthdays, but they're so terribly predictable if you ask me. That's where the lovely crescent roll comes into the equation. 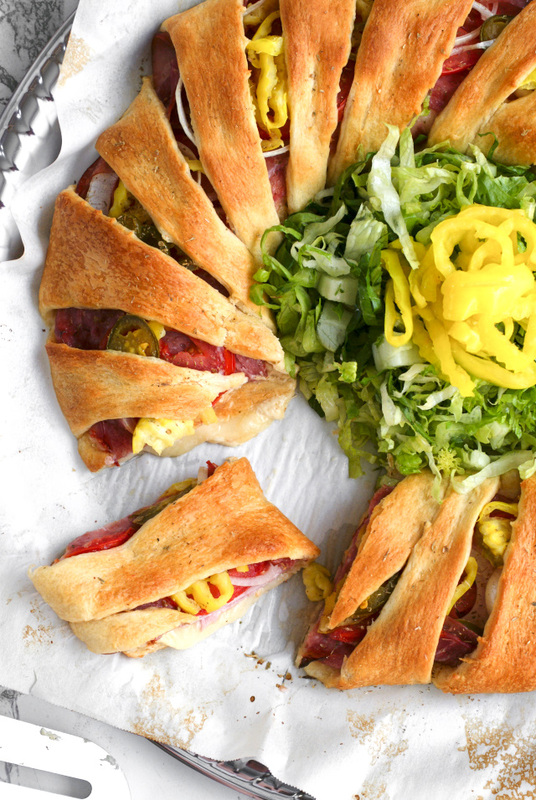 If you're looking to step up your party food game, this is the way to do it. It is so easy to pull this recipe together and the finished product will be the star of any spread! First, get yourself something round to use as a guide for the center of your ring. I used an upside down bowl and it was the perfect size. 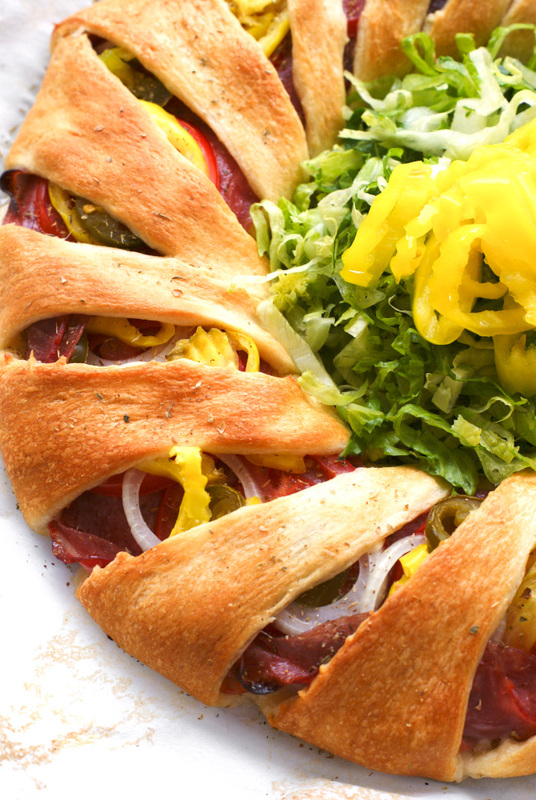 Line your crescent roll around the bowl, overlapping them just a bit. Press down on the overlapped pieces to make them a little more even in thickness. Once you have your round shape, you can take that bowl out of the center. Now comes the fun part: layering all of the ingredients on top! Start with the provolone cheese. You could add the cheese after the meats, but I like it first so that it gets all gooey melty with the crescent roll on the bottom. 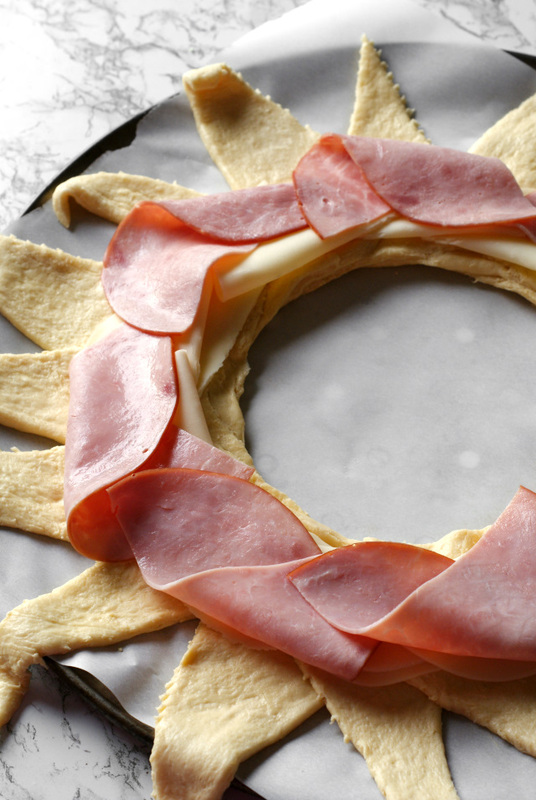 After the provolone comes the ham. You can fold it all pretty like me, or just throw it on there. Just be careful not to let it overhang too much outside of the crescent roll center. Then comes the hot capicola. This is key. 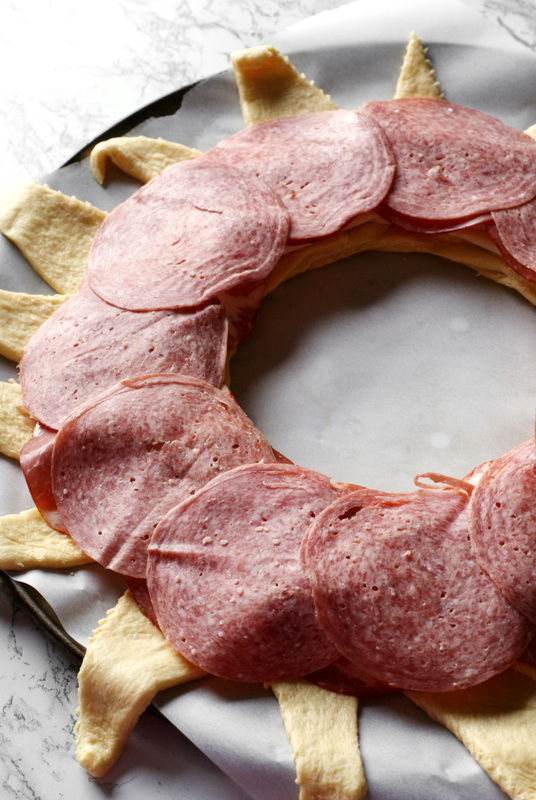 If you try to make your Italian sub with just ham and salami you end up with a glorified ham sandwich. No bueno. 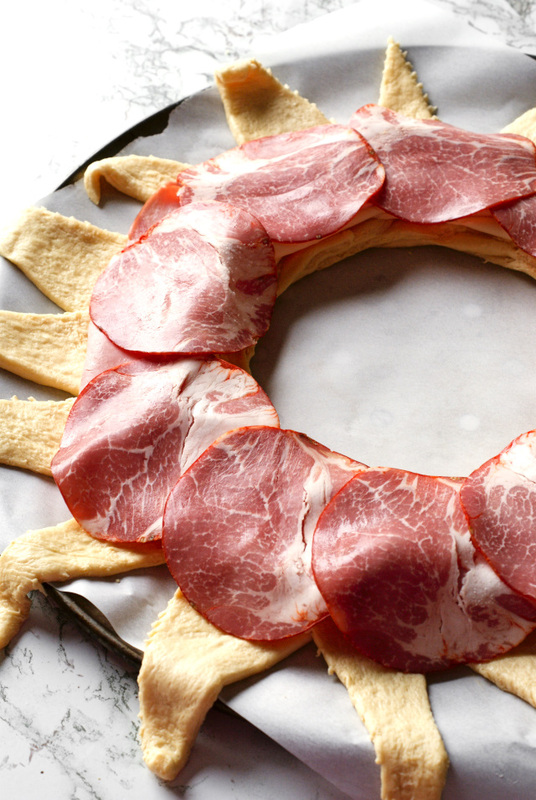 Get the capicola and pile it on there. Salami is the final portion of the meat trifecta. Yo can go with either hard salami or Genoa salami. Both will work. Next, go out to your garden and bring in one of those beautiful plump tomatoes that you've got growing. Slice that bad boy up and lay the slices over the meats. Not too many though! A single layer is good. Not growing tomatoes? You should be. That's a whole nother conversation, though. Onions! You've got to have onions on an Italian sub. Lots of onions. If you're worried about onion breath, go find another recipe. Because salami isn't going to be doing your breath any favors either, if you know what I'm sayin'. So, yeah, onions and more onions. Finally, added to the top of the stack like a golden crown of vinegary jewels; the pickled peppers. 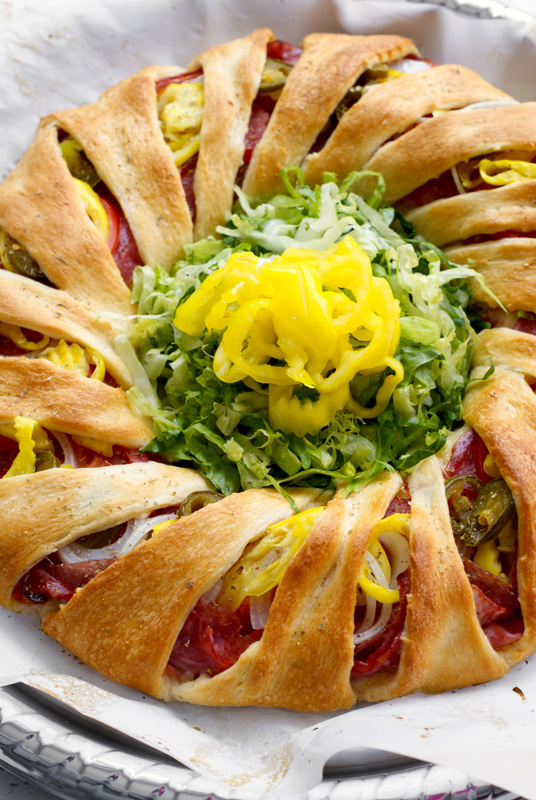 Add a whole lot of banana peppers with just a few jalapenos thrown in for good measure. Just make sure they are well drained! 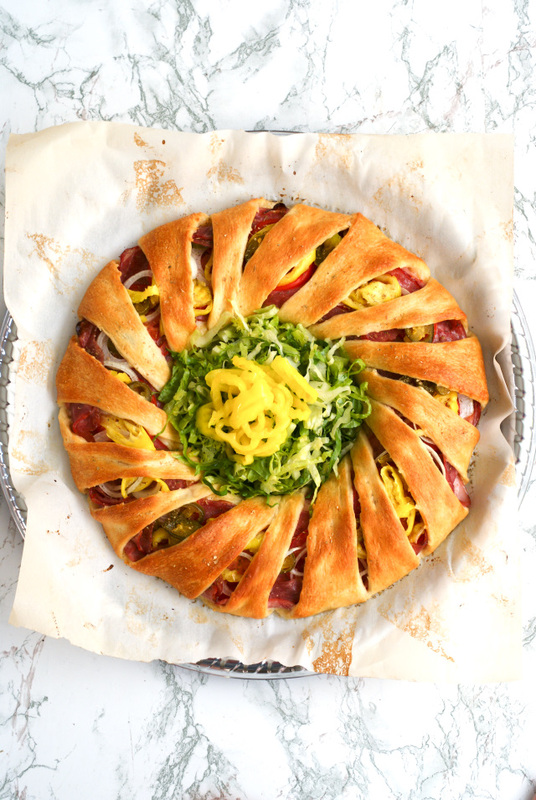 Then you're going to take all of that gorgeous filling and wrap it up with the crescent rolls like it's a present. 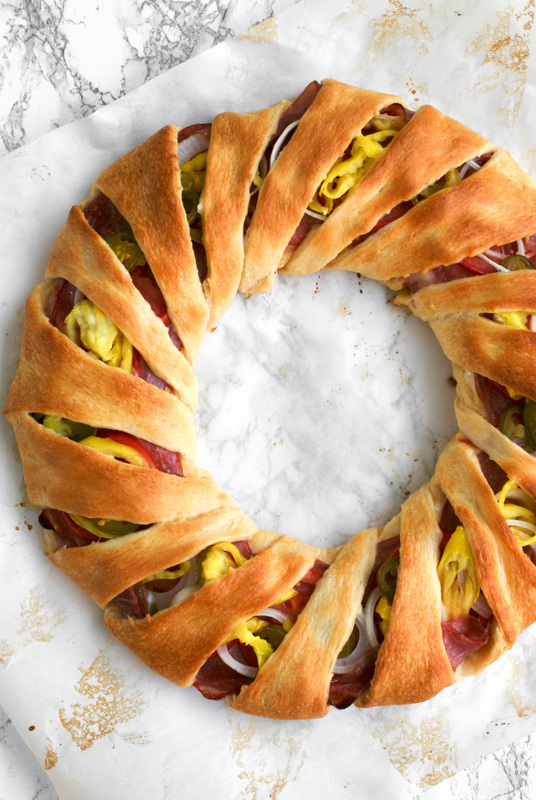 A big, fat, Italian sub present for you and your friends. You give the best presents. 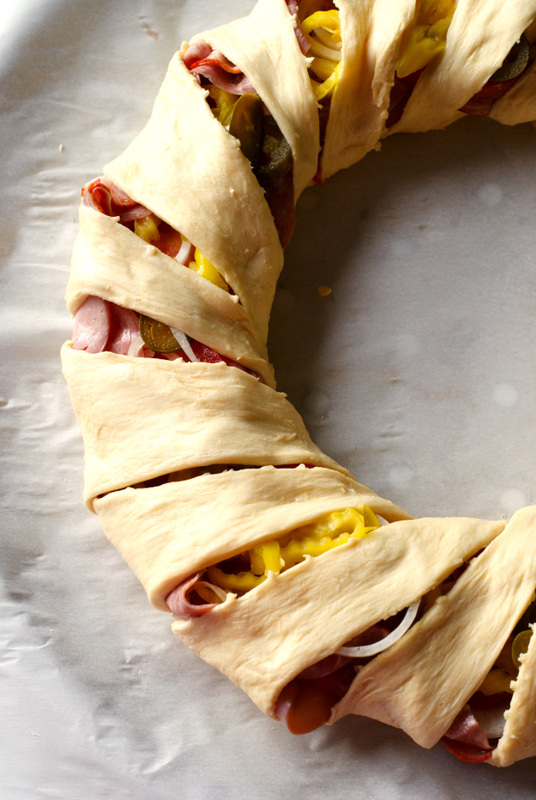 Tuck the ends of the crescent roll underneath the inside edge and you're good to go. Looking good already and it's not even baked yet. Once it does come out of the oven, it's like Christmas. Christmas in August, in my case. 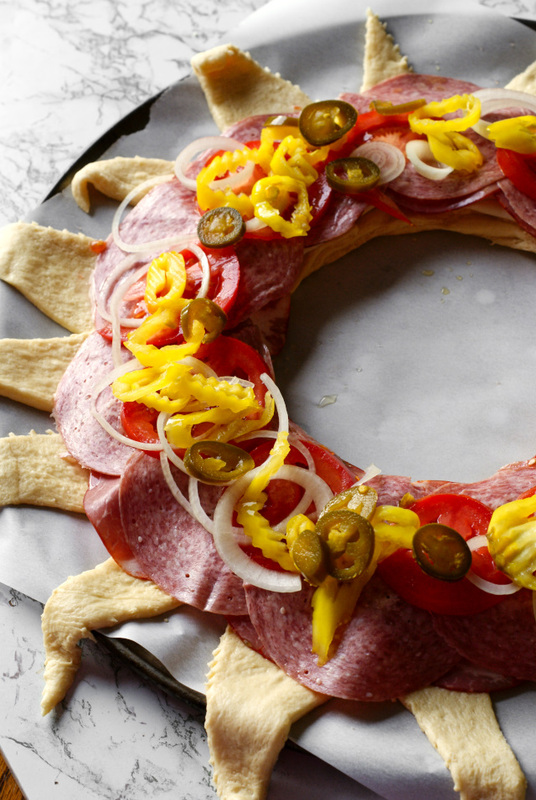 It kind of looks like a wreath, right?! 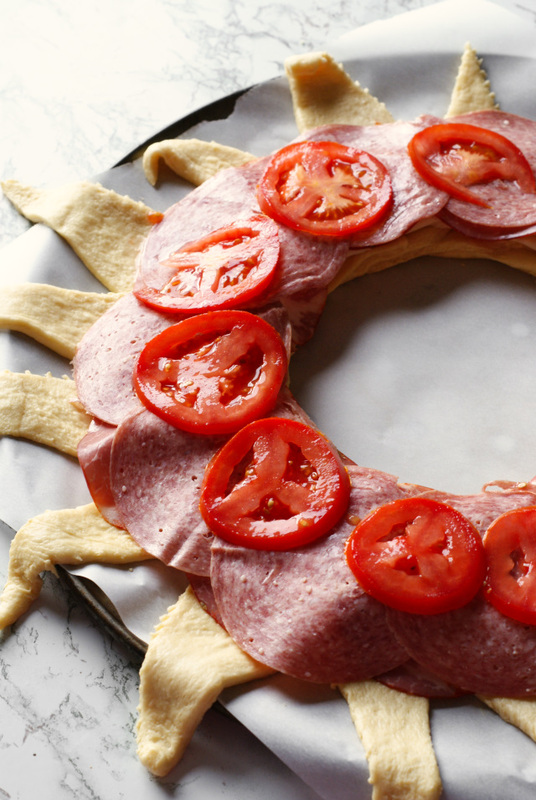 It's a big fat crescent roll wrapped Italian sub present in the shape of a wreath. Very Christmas-y. But so far from the point of the story. Haha. Whoops. The point of the story is that in very little time, with very little effort, you could be making this visually impressive dish for you and your family or friends to enjoy. Heck, make it for your family and friends. There's enough to go around! The final thing you can do before serving this dish is to fill the center with some shredded lettuce. Lettuce is a key ingredient on an Italian sub, but hot and soggy lettuce is less than appetizing, right? 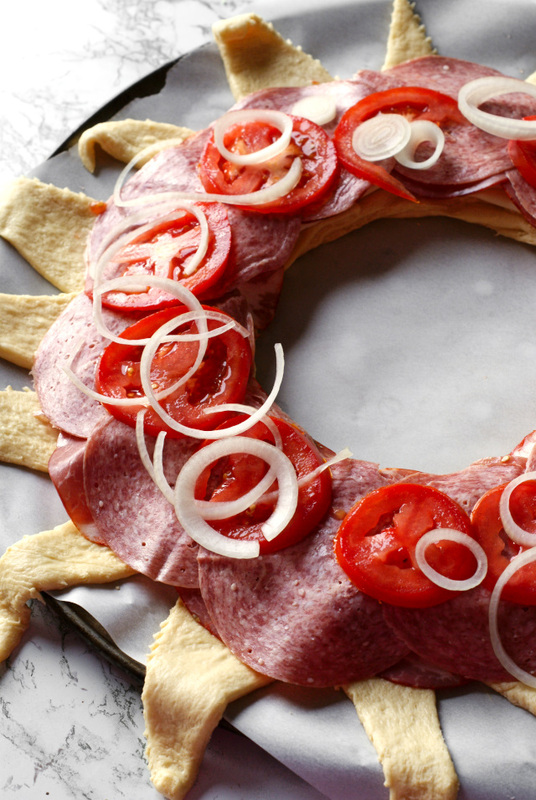 That's what will happen if you bake the lettuce inside the ring. If you serve it on the side, each person can just take a little on their plate with their slice and you have the full Italian sub effect. Perfect. I have several words of advice, or tips rather, when it comes to making sure this recipe cooks properly. First, really make sure you drain your peppers. And I would even go as far as to blot your tomatoes a little if they're extra juicy. If you don't, the bottom of your ring will be soggy. A little bit of moistness is okay, but you don't want the whole thing swimming when it comes out of the oven. Okay? Okay. Next, I bake on parchment paper. I suggest you use parchment paper, too, but it's not 100% necessary. I've never tried it on foil or a bare pan, so I can't speak to how it will turn out with those methods. I'd go with parchment. Lastly, it's not really a tip but more of an observation, this recipe is good served right out of the oven or at room temperature. Also, it can be sliced into small pieces and served as finger food, or cut into larger slices and served with a fork and knife like an entree. Very versatile. 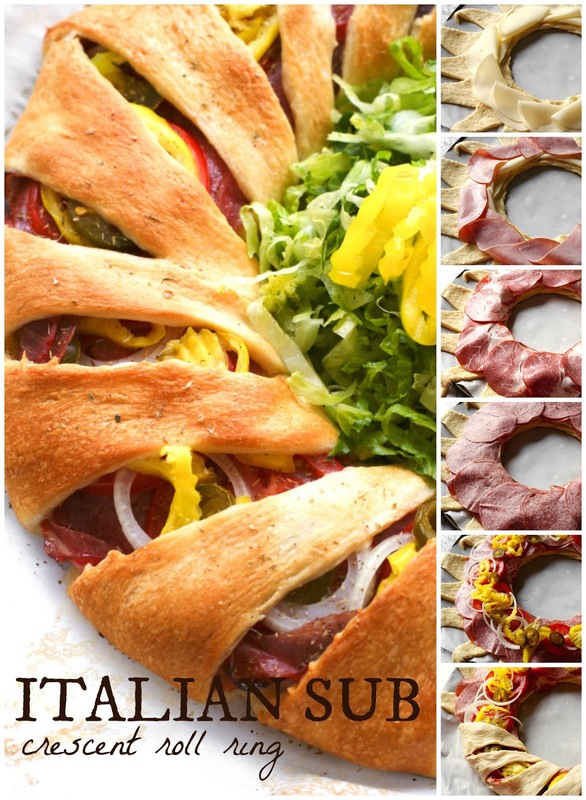 If you love subs like I love subs, particularly Italian subs, and you've been looking for a way to spice up your sub game for get-togethers, totally give this easy-to-make recipe a shot! I know you'll love it! We did. Preheat your oven to 375 degrees. Line a round baking sheet with parchment paper. 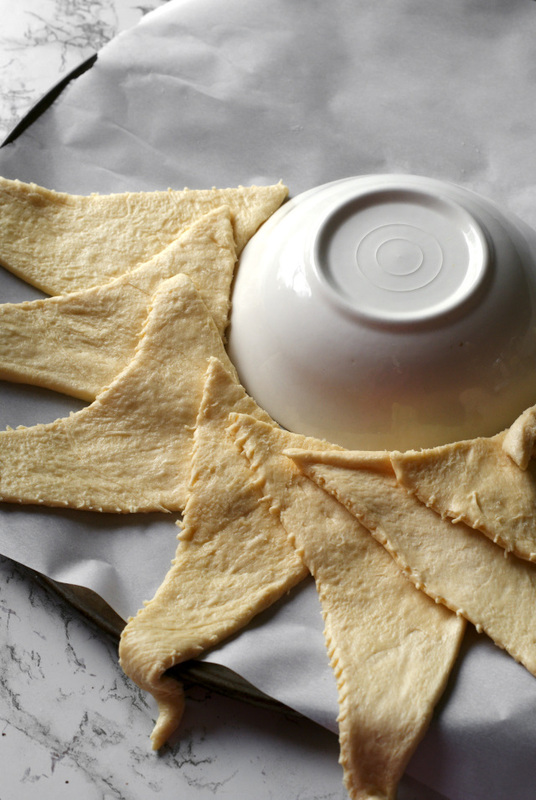 Separate the crescent roll dough into 16 triangles. 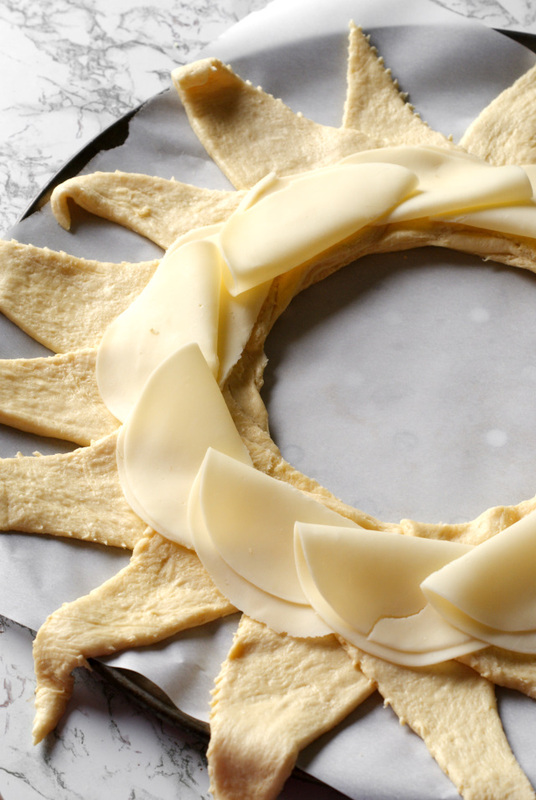 Place the dough onto the baking sheet in a circular pattern with the edges overlapping. Press down on the dough where it overlaps to make it slightly less thick. 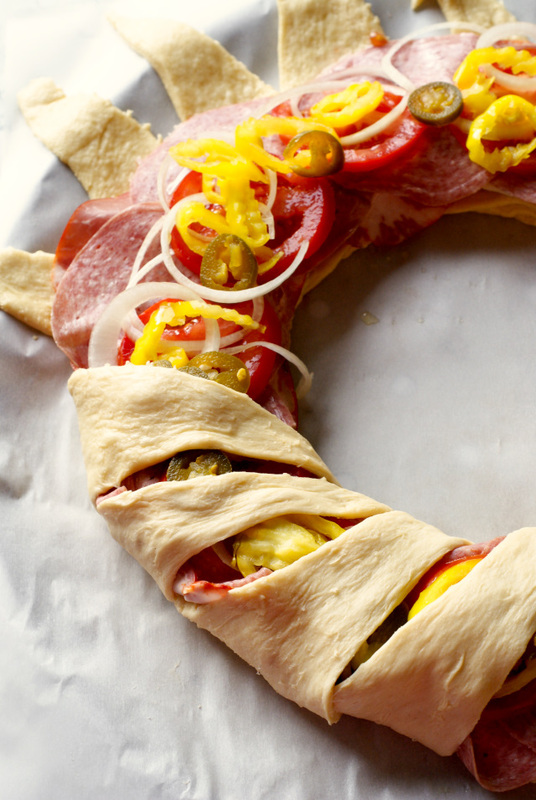 Layer the cheese, ham, capicola, salami, tomato, onion, and peppers on top of the dough. Season with salt, pepper, and dried oregano. Bring each dough triangle hanging over the side of pan up over filling, tucking the dough under the bottom layer of dough to secure it. Repeat around ring until entire filling is enclosed (some filling might show a little). Bake for 20 minutes or until the dough is golden brown and thoroughly baked. Cool for 5 minutes before cutting into serving slices. Source: Adapted from an pin I saw on Pinterest. 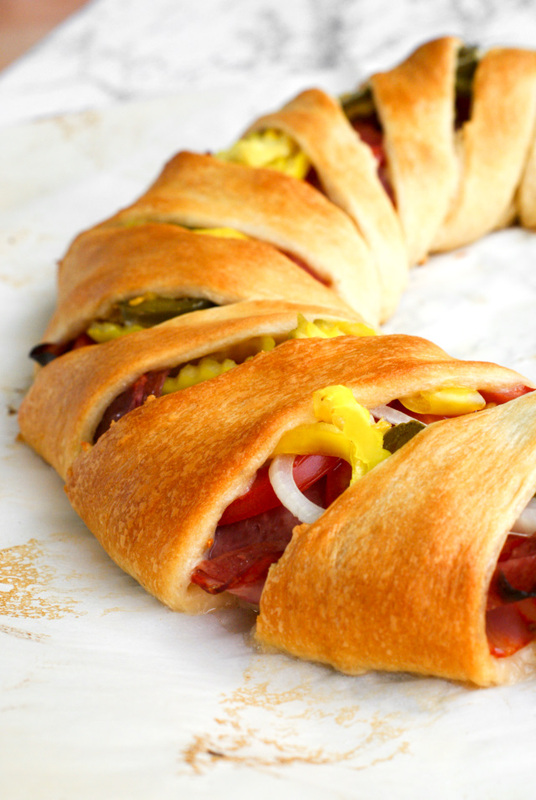 Did you know that making a ring is not the only one of the crescent roll's talents? 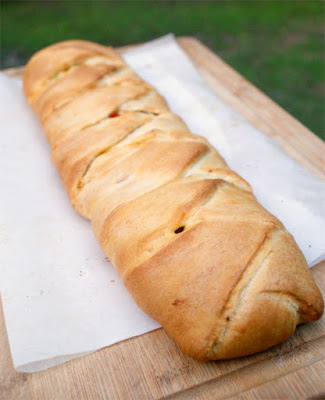 You can also use crescent rolls to make a pretty braid like I did for my Broccoli Chicken Braid! Awesome, right?! Give it a shot!